2015 brought out a bevy of horror and horror-comedies, the latter of which is the subject of today’s review: Gravy. A bit of a trip through a Tromaville type territory, Gravy tells the story of a group of psychopathic cannibals sealing up a Mexican restaurant on Halloween night and taking all of the staff inside hostage with the intention of eating them one by one. 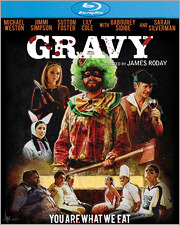 Gravy features several familiar faces, including Sutton Foster, Jimmi Simpson, Lily Cole, Michael Weston, Gabourey Sidibe, Paul Rodriguez, and Sarah Silverman, the latter of which appears in the movie’s opening and closing moments. It was directed by Psych star James Roday, who also appears in a cameo in the movie alongside his Psych co-star Dulé Hill. Gravy as a horror comedy is surprisingly more hit than miss, but in a very cartoonish way. It’s also very unapologetic for being what it is, particularly when it comes to the gore. There aren’t heaping amounts of it, but what is there definitely doesn’t hold back. It’s hardly a low-brow movie either, as the dialogue will attest to. It has plenty of witty banter to spare and is always on the move with over-the-top characters, a barrage of visuals, and an ever-escalating storyline that just gets weirder and weirder as it goes along. Personally, I like weird, and Gravy is one that doesn’t mind how weird it is, and I like that. It also wears its influences a bit on its sleeve. For instance, it’s not an accident that the name of the Mexican restaurant in the film is named “Raoul’s”, which is a reference to Paul Bartel’s twisted comedy classic Eating Raoul, a sort of grandfather to a film like this. It’s by no means on the same level as say a David Lynch project, but its humor is pitch black. The characters are all fun and have interesting things to say and do, to say the least. It’s probably one of my favorite horror comedies of the year, but I think you have to have a certain taste in weird movies to get the full enjoyment of it. The Blu-ray transfer of Gravy features a very strong presentation. Shot on RED cameras, it soaks up a lot of image detail, but unfortunately, black levels are where it falters a bit. There is some crush to some of the more darker areas of the frame, losing some visual information. However, it’s still quite strong with beautiful color reproduction, lovely skin tones, and satisfactory contrast and brightness levels. There doesn’t appear to be any digital augmentation such as artificial sharpening, although I don’t believe it would have been necessary anyway. It’s a solid, depthful presentation, overall. For sound options, there are two: English 5.1 and 2.0 DTS-HD. Dialogue is very well-prioritized, although mixed a bit too low in some scenes. Score shines through beautifully, as do the many songs utilized, and sound effects have some decent heft to them. Neither track is ripe full of dynamic range, per se, but there is some nice spatial activity. Between the visuals and the sound, it’s a strong presentation that isn’t entirely without fault, but should please most enthusiasts. There are also subtitles in English for those who might need them. The extras are brief, but worth a look. There’s an audio commentary with director James Roday & actors Sutton Foster and Jimmi Simpson, a What is Gravy?EPK featurette, a second EPK featurette, and the film’s trailer. Gravy probably won’t be on anyone’s top ten list at the end of the year, but I enjoyed it quite a bit, and I think fans of horror and satire will find something of value here. With Scream Factory’s pleasant treatment of it on Blu-ray, it’s definitely worth checking out.